I first saw this sari worn by Vidya Balan and I loved it. 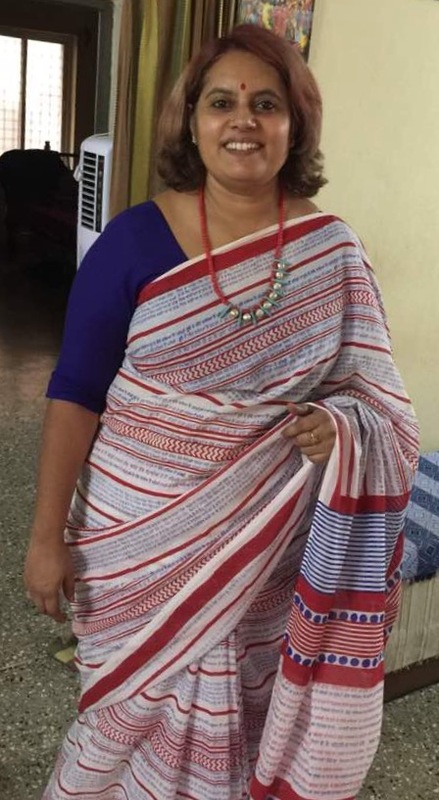 I am a fan of hers and I always liked her wearing saris … I immediately checked with Dastkari Haat Samiti if they had another piece, but they didn’t at that time. Suddenly the sari became available in Dec and I immediately ordered it. I got it with me to Hyderabad, but we went off to Chennai and I couldn’t get the fall and pico done till a week back. I wore the sari to Kabir’s office on Monday and then to meet Nisha and family. Its soft cotton that doesn’t wrinkle easily and its super comfortable to wear. I have always had a huge soft corner for the Sardar community and this Sari has the Punjabi wedding song printed on it in Gurmukhi. No wonder I wanted it !! Isn’t it gorgeous? Nisha opened the door and wanted me to leave the sari behind :):). The neckpiece has an interesting story – its coral beads that I picked up from Dhanushkodi when we visited in 2015 just to give some business to the guy who was selling them there. Nisha strung it into this stunning neckpiece. Please visit her website – http://www.adorjo.in and buy. 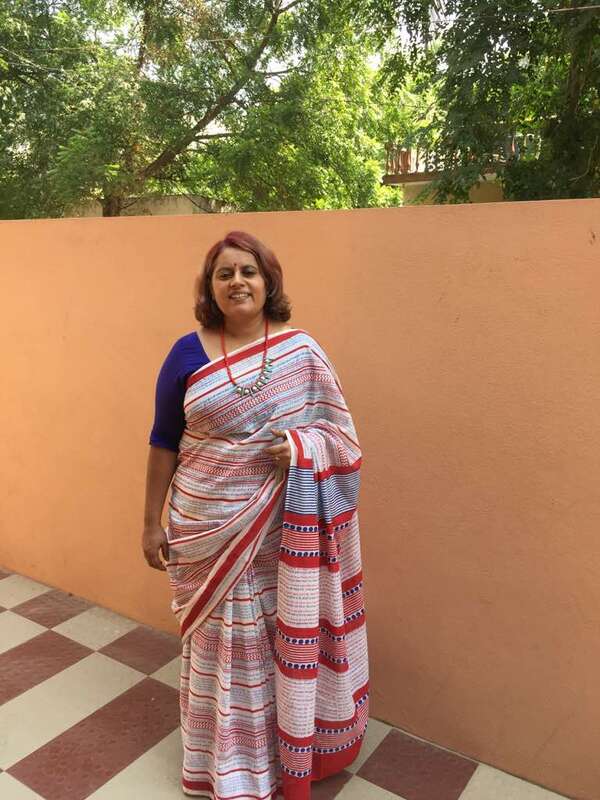 Its an inexpensive sari and kudos to Dastkari Haat for bringing such hand block printed beauties at affordable, inexpensive prices. Here’s another pic of me in brighter light, but from the wrong side :):):). 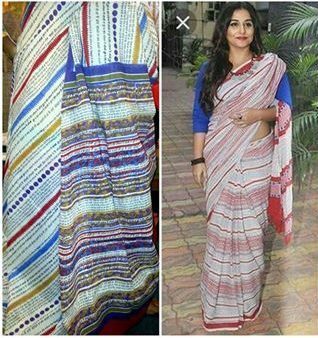 And yes, the picture perfect Vidya Balan in this sari – I took the picture from the Dastkari Haat Samiti’s facebook page. Such a unique design. Appreciating the person who conceptuslized this design. Wedding song in Gurmukhi, who would imagine! Wow!!! Yes Swapna, whoever thought this up requires special appreciation! Amazing creativity.